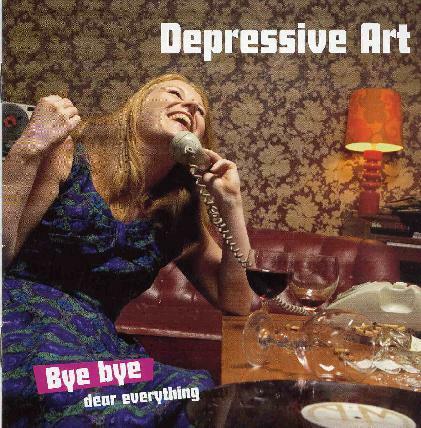 Depressive Art are a fairly new band from Göteborg with a really old sound.. The band want to be like from the late 60’s with influences from the psychedelic side of the Stones and the Doors, but in general they have heard a lot of the slick side of Swedish popular acts and take a little too much of this influence in, sadly… Have they heard Sound Track of our Lives?? A few times…. Not that they sound like them all the time but the way they make their semi-retro thing more radio friendly… The singer has quite a cool dark and deep voice. Anyway, let’s get into the record. Solar System, the opening track, is totally STOOL like. How to Breathe is a more bluesy track with harmonica and some high pitched complementing vocals to the deep lead vocal. Psychedelic Ghost Ride is a fast paced track with the singer really belting out the vocals and the psychy keyboard line that comes in and out of the track, is quite cool. Dear Everything is a slower ballad like track that sounds a bit like Dylan to start with and a very melancholy vibe. Breastfed Lies keeps things downbeat and the singer really sings in a different vibe on this track. His gothic roots showing. Beautiful song. Season for Regret is a pretty ordinary uptempo song. It does not speak to me. Old Man’s Quarter is a great song with lots of cool elements and the first track on the CD where they sort of jam it out a bit. On United Cosmos the singer changes style to a more radio friendly style but the vocals are a bit psychedelic with the way the backing vocals float into the sound. Sadly, the band leaves very little space in their songs for any of the members to really play. There is few guitar, keyboard or other solos of any type until the last track. They speak of doing a lot of jamming in the rehearsal room in the interview on the web but none of that is reflected on the CD. All tracks are tightly composed and no jamming or solos at all until the end of the CD. On Solid Ground begins with a piano and vocal but soon picks up, but the piano plays a large part in the track. If you listen you will notice the trombone as well. This track fades directly into Solid Ground part 2 and the band get psychedelic for the first time on the CD and does some cool jamming with the organ and guitar as the acoustic guitar keeps strumming and the rest of the band keeps the mellow groove going. You can hear the Roland space echo effects in the background as well. Nice way to end the CD.